NEW MEDIA (BREITBART) TAKE DOWN OF ANOTHER OLD MEDIA TOP GUY IN EDIT-GATE BROUHAHA…….. – The Tundra Tabloids……. 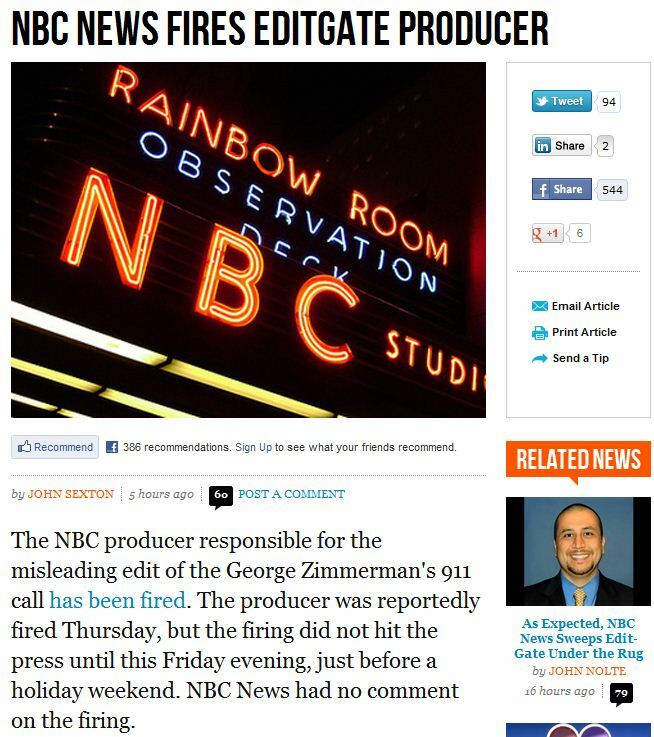 NEW MEDIA (BREITBART) TAKE DOWN OF ANOTHER OLD MEDIA TOP GUY IN EDIT-GATE BROUHAHA…….. There was speculation earlier today that Today show producer Jim Bell might have been the person responsible for the edit, which portrayed Zimmerman as a racist, or having a racial motive in shooting Trayvon Martin. Bell did not respond to a question directed at his Twitter account earlier today. Brian Stelter of The New York Times credits NewsBusters.org for being the first to catch NBC’s edit. He provides a link to this NewsBusters post dated March 30. However, the NewsBusters story is actually based on, and links back to, a story published here at Breitbart.com two days earlier. In that story, author Dan Riehl highlighted the edit to the Zimmerman 911 tape as it appeared in print at MSNBC. The MSNBC story was originally published March 21st, six days before the same edit was used in the Today show broadcast. Yesterday, a Reuters story credited both Breitbart.com and NewsBusters for bringing the problem to the attention of NBC executives. Previous Post Previous Post RADICAL FAR-LEFT MEDIA MATTERS LOSES HEAD ANTI-SEMITE MJ ROSENBERG……..
Next Post Next Post TOP FORMER OBAMA ADVISER, VAN JONES PLANNING ‘ARAB SPRING’ TYPE REVOLT IN U.S. STREETS……..